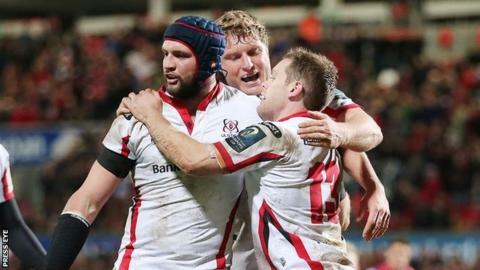 Ulster kept alive their hopes of qualification for the Champions Cup knockout stages with a bonus-point win over the Scarlets at Kingspan Stadium. Darren Cave and Ruan Pienaar scored tries which Ian Humphreys converted for a 14-6 lead at half-time. Rhys Priestland landed his third penalty to reduce his side's arrears but Ireland stars Tommy Bowe and Rory Best then crossed for tries. Scarlets now have to win their final three matches. Priestland knocked over a third-minute penalty from in front of the posts after Pienaar, making his first appearance of the season for the Irish province following injury, was penalised for not rolling away. Ulster assumed control for the remainder of the first half but Humphreys missed two relatively straightforward penalty attempts from close range. Then a late tackle on the home fly-half led to Scarlets flanker James Davies being sent to the sin-bin for 10 minutes. The hosts took full advantage of their extra man, establishing an 11-point lead as centre Cave and the returning Pienaar scored fine tries. After 14 minutes, Humphreys passed to Bowe, who made a break down the right wing and cleverly passed inside to Cave, who raced over to touch down. Four minutes later Cave surged through the centre of the visitors' defensive line before offloading to the supporting Pienaar, who shrugged off an attempted tackle from Scott Williams before diving over beside the posts. Priestland reduced the deficit with his second penalty after Franco van der Merwe was penalised for being offside at a ruck but the Scarlets found themselves a man down again five minutes before the break as Liam Williams was yellow-carded for lifting Louis Ludik in the tackle. A Priestland penalty attempt from 45 yards drifted wide of the posts just before half-time. The Welsh fly-half was successful with another kick at the posts 15 minutes into the second half, but Bowe responded with a try in the corner after an impressive flowing move a minute before the hour mark, Humphreys missing the conversion. Best then rumbled over from a maul for the crucial fourth try on 68 minutes but Humphreys was again unable to add the additional two points. The home side were forced to play the final five minutes without scrum-half Pienaar, who was sent to the bin for a deliberate knock-on as replacement Gareth Owen prepared to bear down on the line. Ulster will await fitness reports on Stuart Olding, Wiehahn Herbst, van der Merwe, Stuart McCloskey and Nick Williams ahead of next Sunday's game at Parc Y Scarlets after all five had to be replaced due to injury. Ulster: L Ludik; T Bowe, D Cave, S Olding, C Gilroy, I Humphreys, R Pienaar; C Black, R Best (capt), W Herbst, D Tuohy, F vd Merwe, R Diack, R Wilson, N Williams. Replacements: R Herring (for Best 76), A Warwick (for Black), D Fitzpatrick (for Herbst 48), A O'Connor (for van der Merwe 48), C Ross (for Williams 66), P Marshall (for Pienaar 75), S McCloskey (for Olding 40), M Allen (for McCloskey 67). Replacements: Kirby Myhill (for E Phillips 72), Phil John (for R Evans 72), Rhodri Jones (for Lee 65), George Earle (for Ball 62), Lewis Rawlins (for J Davies 66), Rhodri Williams (for A Davies 65), Steven Shingler (for King 79), Gareth Owen (for L Williams 62).